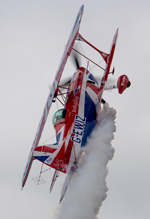 After a 2014 show beset with bad luck, the organisers at Royal Naval Air Station Yeovilton had to make sure that the Navy's premier air show could still stand with the best, especially in a year with only one official RAF airshow. 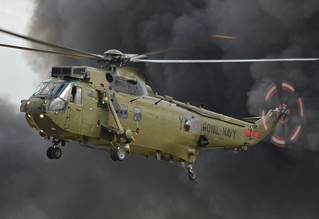 Fortunately, they had the benefit of some very strong themes in the form of Westland's centenary and RNAS Yeovilton's own 75th anniversary, Yeovilton again demonstrated the relevance of both their annual airshow and British naval aviation. However, it was tinged with some degree of sadness as we saw the final Air Day appearance of the beloved "Junglie" Sea Kings. Sam Wise stared into the sun all day for UK Airshow Review. Photography from the UKAR Staff Team. One of the things which made this year's Air Day extra special was the fact the event saw a number of first-time appearances and comebacks. Making its very welcome return to the UK airshow scene was the Royal Navy Historic Flight's Swordfish I W5856, having recently come out of restoration and making its first flight at a UK airshow since 2003. With the RNHF's other Swordfish suffering from poor serviceability over the last few years, the sight and sound of one of Fairey's most important aircraft in the air again was a real joy, with Simon Wilson and his crew proudly flying the White Ensign and saluting the crowd as they performed a number of flypasts (understandably the Swordfish is not the most aerobatic of aircraft!). Simon also took to the air again later on; this time in his Zlin 526, one half of the new Czech Mates team (the other aircraft sadly being unavailable in time for the Air Day). A very capable aerobatic aircraft, the performance was well executed with plenty of manoeuvres immediately leading into another - the team plan to perform later in the year as a pair, and should prove to be quite a display when flown in formation. Our forums even got a mention over the PA as the commentator explained that our members came up with the name for the team! A rare treat, appearing as part of the Westland Centenary theme at the show, was the AW609 Tiltrotor aircraft. Billed as the future of off-shore transport, and one of the show's stars of the flying display, the aircraft flew into its display in horizontal flight configuration before transitioning to vertical flight mode and coming into the hover in front of the crowd. It gave several pirouettes along the display line before completing another pass in short-takeoff configuration. It may not have given the most aerobatic or dynamic display, but the rarely-seen AW609 showed off the advantages of the technology involved, and any chance to see a tilt-rotor perform in this country is most welcome. Of a more conventional appearance were the Royal Navy's helicopter display team, the Black Cats - performing for the first time at the Air Day with a pair of Wildcats. The Wildcat is not (yet) cleared for the same aerobatic capabilities that the Lynx is, so some of the breathtaking moves from earlier display seasons were not present, however, the agility of the helicopters and skill of the pilots was nicely shown off. In stark contrast to last year, the show secured strong support from the Royal Air Force, with the Red Arrows, BBMF & Chinook all performing their typically polished routines. 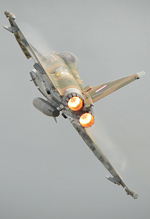 As seems to now be a regular occurrence, the RAF Typhoon display was flown using the "Hurriphoon" aircraft in Battle of Britain camouflage, replacing 29(R) Squadron's centenary special schemed aircraft. This year's RAF Typhoon display is regarded by many as the most aggressive routine seen for a number of years, it seems the jet is finally coming of age in terms of display performances. There had been much excitement surrounding what would have been the UK debut of the Norwegian Air Force Historical Squadron's MiG-15, the first display of the type in this country for nigh on 20 years. Sadly it became apparent that the aircraft had gone unserviceable in the days before the show, and consequently was unable to make it. Fortunately, the NAFHS' other contribution, a pair of Vampires made it over the North Sea and were able to take part in the display. They flew a tight formation routine, which was a fantastic sight in the Somerset skies matched by the sound of two Goblin engines in unison. That said, a lot of their passes were flown at some distance from the crowd - as the Vampire is not a very big aeroplane it was at times hard to make the pair out against the grey clouds. One aircraft which certainly does not have that problem is the Vulcan! Making its last appearance at the show, it performed a noisy display over the airfield, if not the most aggressive one it's made, with no less than three of the famous howls. What stood this display out from most others is that on landing after the display XH558 deployed its huge braking parachute, the sight of it streaming behind the aircraft down the runway not being a common sight, for reasons of logistics and cost. As with previous years the delta jet taxied into a static position among the crowd line, causing a great throng to gather around it as it shut down; proof if needed that after seven years it is still the public's favourite item on the airshow circuit. 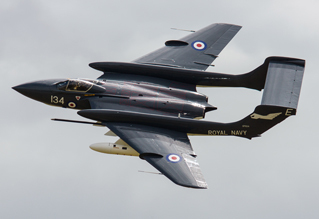 The enthusiast's star item among the classic jets, however, was the Sea Vixen. This was probably the first opportunity for many to see the aircraft in quite some time; its last few years being plagued by an awful run of luck which prevented it from making many appearances at all. The commentary described its display at the start as one that would be graceful but restrained, but 'Foxy' was clearly happy to be back in front of an audience as it was thrown about the sky with gusto by Simon Hargreaves, its Avon engines making a tremendous racket throughout, and the crowd got to see the unique aircraft's beautiful lines from almost every angle. These four aircraft all took part in an outstanding formation in the morning. The Sea Vixen was flanked by a Norwegian Vampire on each wing while the Vulcan followed to complete a unique British "V-Jet" tribute which will certainly not be seen again. This was undoubtedly one of the highlights of the flying display and this was reflected in the decision of the commentator to remain silent during both of the formation's passes allowing the sound of the eight engines to reign supreme, the only other sound being some quietly reverential music coming from the PA. Though the passes took place in some of the worst light and greyest cloud of the day, it was a sight that will long remain in the memories of those who saw it. Yeovilton this year saw a superb presence by foreign air arms with strong appearances both on the ground and in the air - in fact, the Air Day caught several unique items that are unlikely to be seen elsewhere in the country this year. Among them were two F-16s from the Royal Norwegian Air Force, one sporting a lovely tiger scheme; a US Air Force C-17 Globemaster III which, even at the edge of the showground, dominated the skyline with its sheer size; and a beautiful Falcon 10 from the French Navy. 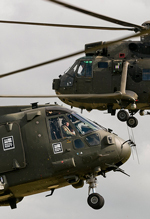 Another debut was made by the Belgian Air Force who sent an NH90 utility helicopter, another UK debut. However the stars of the static were undoubtedly the NATO E-3A Sentry and a pair of A-10C Thunderbolts from the US Air Force. 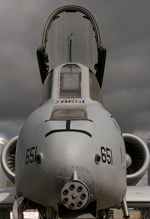 In Europe as part of a Theater Security Package from the USAF, the Warthogs attracted much attention on the day and were extremely popular with both the public and aircrew alike. In fact they had opened up their aircraft, set up and were ready to chat to those attending even before the gates had opened! The flying programme also saw several contributions from foreign militaries. The Czech Air Force L-159 ALCA made its return to the Air Day, having first appeared in 2013. Sporting a Czech flag behind the pilot's seat, the display was highly aerobatic and more akin to a fighter display than a ground attack aircraft derived from a trainer - in fact, the type's small size belies the loud noise it can create! Featuring rolls, loops and a stomach-turning full topside pass (though the display was sadly absent of flares this time round) it was still a very punchy and sprightly display from a rarely seen type. The same, perhaps, cannot be said for the Patrulla Aguila. The team is celebrating their 30th anniversary this year, and are appearing at two UK shows to celebrate. They are a great catch for Yeovilton and a rare sight in UK skies, but their display does not quite have the effect of some other teams. What they present in front of the crowd is of high quality, with strongly flown formations and manoeuvres, and their formation landing is quite superb - but on a billing which also features the Red Arrows the amount of time they spend outside the display area formating is starkly apparent - this is also highlighted by the less-than-musical note of the C-101's engine. Their commentary could have used these opportunities to tell the crowd about the team, their work and the Spanish Air Force, but unfortunately the voice over for the display consisted of little more than announcements of the various formations - this is always a potential occurrence with any display where English is not the commentator's first language, but for this team it served to make the gaps seem that much wider. Having said that - their rare appearances are highly welcome on the UK display circuit and we'd rather see a Spanish flying presence than not. Without any doubt the most highly anticipated act of the show, let alone the flying display, was the French Navy's contribution of two Rafale Ms and two Super Etendard Modernises for a mixed type demonstration. This marked what will likely be the latter type's final appearance in the UK with it's retirement from service due next year. It's always great to see venerable types that are still in service taking part in flying displays, and the Super Etendards did not disappoint. After a fantastic takeoff (with the SEMs launching in formation while the Rafales saw full reheat zoom climbs), the aircraft came together and flew a formation flypast with all four aeroplanes lowering their arrestor hooks. The Rafales broke off to allow the Super Es to perform the first half of the demo - flying together for some of it and then breaking off into individual displays. Despite the limited manoeuvrability afforded to such old types they managed to keep one of the aircraft in front of the crowd continuously, and the beautiful shape of the aircraft and the wonderful note of their engines were a great entertainment. The dirty pass in particular was a fantastic sight; with the air brakes, undercarriage and arrestor hook all extended. This was contrasted by the cutting-edge modernity of the (no less beautiful, mind) Rafales, which filled the air with the thunder of afterburning turbofans. Previous displays have proven the potent agility of the Rafale and to have two in the air at once, performing rolls, loops and dirty passes was nothing short of breathtaking. 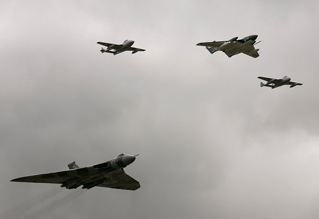 The quartet then reformed for one final formation fast pass before their display came to an end. One of the most powerful acts seen for some time, the French Navy might have stolen the crown of the UK 2015 airshow season - it will almost certainly be the highlight of the year for many and if this is to prove the final goodbye from the 'Super E' in the United Kingdom, it was a magnificent one. On paper, Yeovilton's 75th anniversary theme was well filled out. A host of the base's former naval types were gathered for both flying and static displays, seeing Shuttleworth's Sea Hurricane and Kennet Aviation's Seafire take to the skies alongside an Avro Anson, as well as the aforementioned Vixen and Swordfish. On the ground the restored Sea Harriers and Phantom were on display among the current RN assets. As a significant anniversary and one of the primary themes of the show, the organisers had done a sterling job in acquiring the items for the show, but on the day there was no real sense of the theme being portrayed. There was little mention of it during the commentary and the particular items were spread out and disparate, meaning that while the show definitely benefited from having the theme as it attracted suitable items; what was an important and meaningful anniversary was somewhat undermined. A more successful application of the theme might have seen a chronological display of the base's/Navy's types in the display, or even a flypast; logistics and timing might not always mean such a thing is possible but it would have made a stronger impact. A theme which was very well put together, though, was the Westland's centenary. In fact, the static park contributions were almost arranged in a chronological sense, with many of the historic types placed together while the current Navy Westland assets were gathered in the same enclosure as well. Westland had brought banners, placed next to each type, with a silhouette of that type printed on it, and there were many AgustaWestland staff and crew talking to the public. Modern company helicopters on display included AW149s, one in HM Coastguard colours and one in SAR configuration, the return of the menacing-looking Italian HH-101A Caesar, and of course the AW609 in the flying programme, representing the future as well as the past. 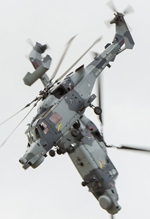 This may have been helped by the fact that AgustaWestland were hosting their own families' event the following day, but at Yeovilton it was the stronger of the two central themes. We saw earlier in the year at RAF Cosford how having strong, well planned, and, above all, precisely defined themes can make a huge difference to how well put together a show feels, and RNAS Yeovilton have again demonstrated this, something that other shows would do good to emulate. 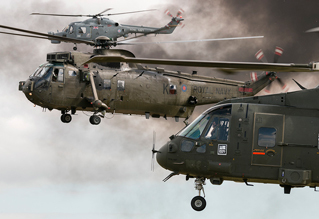 One of the main attractions to the RNAS Yeovilton Air Day, and what really makes it stand out from other air shows in the UK, is its grand finale - the Commando Assault - famous for its en masse demonstration of Royal Marines on the ground and Royal Navy helicopters in the air. This year's was significant for two main reasons; It was the first of the show's finales to feature the Navy's new workhorse, the Merlin HC3, and an unprecedented four airframes were flown in to drop the soldiers into the battle. The Merlin is always an impressive aircraft to see in the air, and to have four in front of the crowd at once was a great reminder of the capabilities that the Fleet Air Arm and Commando force possess. However, the Merlins were present to represent the handover they are receiving from their predecessor, and for this fact the finale was tinged with a great deal of sadness as it is to be the last show for the venerable and absolutely beloved "Junglie" Sea King HC4s. Easily a favourite with the public and enthusiast alike, the Sea King is in its twilight years in British military service and any chance to see them at all is welcomed - to see three in the air together, doing what they've always done best, with the reliability and steadfastness that they have come to embody was fantastic. Carrying in supplies in underslung loads, ferrying troops and popping flares in the climb, the old machines showed they've still got what it takes! It's safe to say that they were given a suitable send off and were used to their very best in the display. 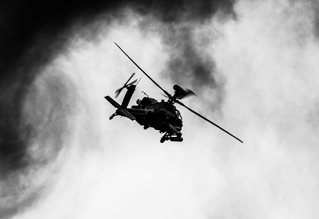 The finale also saw participation from a pair of Apache AH1 and Wildcat AH1 helicopters from the Army Air Corps. No air show is perfect, and there were some negative points that have to be mentioned; regarding both on the showground and off it. We have heard of some real horror stories regarding the car parks and traffic after the show with some people still being inside the car parks, not even on the road, up to two hours after the close of the show. Marshals reportedly were stood around chatting while traffic remained motionless, and when questioned were apparently happy to let the cars sort it out themselves. This might be the fault of the individuals, but it is down to the show organisers to ensure that everything runs smoothly - experiences such as these can be enough to put people off returning in future years. On the showground itself, while the visiting aircraft were quite well laid out, the Royal Navy's own examples were tightly packed together, making photography difficult, and many of the aircraft remained with their covers, blanks and ropes on throughout. Easily the worst offender was the lovingly restored and painted Phantom FG1. There was huge excitement from the enthusiast community for this particular airframe last year, and it was rightly given pride of place with space all around. Not so this year, which saw it placed at the back of the enclosure with a Grob Tutor parked right in front of it, preventing any pictures of the front quarter being taken. Perhaps a minor disappointment in the grand scheme of things, but it's a shame to see star items (for the enthusiast, at least) being used this way. Nevertheless, this year's Air Day can only be described as a resounding success and a fantastic return to form. Crowds at the Somerset base were treated to all the ingredients that make a great show, and for the enthusiasts among them there was plenty to be interested in. It remains to be seen what the rest of the season brings, but Yeovilton will definitely stand up there as one of the best of the year, and it could well turn out that the French Navy's diverse and stunning demonstration of power might be the stand out act of the season. We can only hope that next year's show can live up to the high bar it has once again set for itself.